Whether you are a beer snob or simply want a cheap, ice-cold brew, here are the best places in Bangkok for a frothy beer. Nightlife venues continue to take over the streets of Thonglor, becoming a favorite neighborhood amongst night owls all over the city. One of the most favorite spots of all is Beer Belly, found on the ground floor of 72 Courtyard off Sukhumvit 55. Its modern décor is anything but boring. The outdoor bar’s faded white brick backsplash is complemented with one too many beer options. Customers must decide from an intimidating total of 20 taps before making their way to the highlight of this restaurant and bar: the games. Incorporated into the contemporary décor are bar games that will make even the oldest of customers nostalgic. From beer pong to pool to foosball and more, Beer Belly has everything one needs in order to enjoy a night out on the town. Be sure to pair any one of the beers on tap with one of Beer Belly’s delicious menu items, including loaded laab fries, mini wings, or hickory slow-smoked ribs. Do not let its name fool you: sure, Baan Rai Coffee serves coffee, but the reason this restaurant sees herds of people coming and going almost nightly is for its atmosphere. With hanging twinkling lights, brick exterior, and powerful, blowing fans cooling off the abundance of seating, this is a perfect spot in downtown Bangkok to enjoy a beer without downtown Bangkok prices. In addition to a good selection of brews, Baan Rai Coffee – located only a handful of steps from the BTS Skytrain Station Ekkamai – serves up traditional Thai food. The best part about this restaurant and café duo? It never closes. So grab one too many beers and enjoy this outdoor bar. Right down the street from Beer Belly is The Commons, an open-air concept mall chock-full of delicious eats and fascinating finds. From a store dedicated to children’s play to pop-up markets, this venue aims to please. Beer drinkers will be happy to hear that in addition to all of this, there is a bar dedicated to serving up the most delicious brews: TBC, otherwise known as The Beer Cap. Committed to craft beers, TBC utilizes its draft system to serve up a wide selection of brews. Do not expect to see the same beers twice, as TBC regularly rotates its selection of craft beers, keeping consumers on their toes. This bar finds itself smack dab in the middle of The Commons, with plenty of seating available adjacent its beer cap-studded bar. Those who work up an appetite can venture from TBC to try any one of the many restaurants found at The Commons. Located near the BTS Skytrain Station Phrom Phong, Hair of the Dog‘s inconspicuous entrance may leave beer connoisseurs taking a lap or two while looking for its location. This seriously cool bar is well worth playing hide-and-seek with, however. Small yet noteworthy, this beer bar is serving up a total of 13 rotating taps. Hair of the Dog is the creation of two Canadian beer lovers, Pete Spalding and Mike MacDonald, and now they are the proud owners of one of the hottest beer spots in Asia. Those beer drinkers who do not know their ales from their lagers will be pleased to hear that Hair of the Dog’s friendly and knowledgeable staff is at the ready to find every customer’s perfect drink. The bar also doubles as an eerie hospital of sorts, with surgical lights illuminating its concrete bar and seating made up of examination tables. In addition to beer, this bar is serving up bites that pair perfectly with their rich brews. Located on the 47th floor of the United Center office tower is Cloud 47, a rooftop bar that locals and tourists alike have never seen before. While the capital certainly has its fair share of rooftop bars, none are as laid-back (and arguably reasonably priced) as Cloud 47. 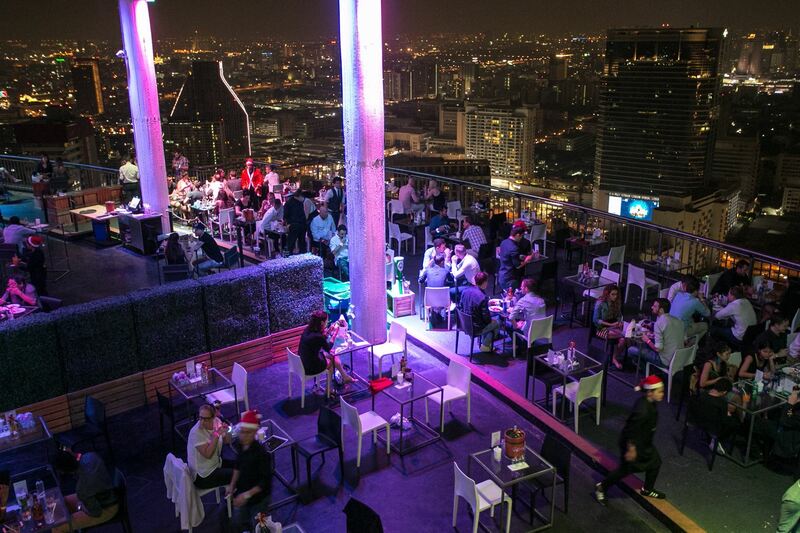 This rooftop restaurant and bar is located near some of the top attractions in town, including the sprawling Lumpini Park. After a day of exploring, this bar is a perfect spot to sit at and unwind, all the while enjoying an ice-cold beer while looking out into Bangkok’s immense, sparkling skyline. In addition to a number of different cocktails and wines, Cloud 47 has draught imported brews and the usual Thai beers. While the beer menu is not extensive, visitors of Cloud 47 come and stay for the incredible view. If customers think TBC has it all, they will be more than pleasantly surprised with its sister company, BREW Beers & Ciders. This bar has a large selection of beers and ciders: 500 to be exact. Imported from all over the world, even the most traveled of beer drinker is sure to find the brew they so desire. Some of the countries that customers will find beers from include Australia, Mexico, and Japan, just to name a few. With an additional 10 beers on draft, this bar aims to give visitors of the capital the best-crafted brews in the city. The bar itself is designed to look like the back room of an actual brewery, with rustic, wooden décor and beer paraphernalia throughout. Customers can opt to sit outside in the open-air courtyard, or those who want the outdoor ambiance without the heat can sit in the restaurant, consisting of floor-to-ceiling glass walls. BREW Beers & Ciders is serving up a number of savory dishes to pair with the drinks as well. Two Mexican brothers were somehow able to bring the best of Central American food and drink to the City of Angels. Their fairly new restaurant, The Missing Burro, has taken refuge off a quiet soi in the otherwise thriving neighborhood of Thonglor. Regardless of its secluded spot, the quaint restaurant seems to attract quite the crowd, especially on the weekends. While the authentic Mexican cuisine being cooked fresh is certainly an added bonus, their alcoholic beverages, from their delicious margaritas to their wide variety of imported beers, are drawing in the crowds. From Coronas to Day of the Dead and more, The Missing Burro has enough beer to go around. W District is a multitude of things, but surely one of the best aspects of Sukhumvit’s largest “creative space” is the outdoor eating and drinking area smack dab in the center. In addition to cafés, a rooftop dining option, and who could go without yet another 7/11 convenience store, W District’s main area for eating and drinking almost seems like its very own night market. The center is made up of sketchy and rickety chairs with equally breakable tables, some of which are held up with thin pieces of wood. The menu, however, is what has visitors sold, with its incredibly enticing prices. Nowhere else on Sukhumvit can you get a bottle of Blend for ฿400 (approximately US$11.32). The usual Thai beers also make an appearance on the menu in addition to different sodas and liquors. After having a beer (or two), feel free to meander through the multitude of vendors selling everything from falafel to pizza and more. Cheap Charlie’s is not for the fainthearted. The outdoor bar is frequented by everything from cockroaches to rats. Regardless of these unwarranted guests, this bar remains one of the top places in the city to have a drink. Why? The prices. Every drink, regardless of its makeup, is only ฿80 (approximately US$2.30). In addition to the cheap drinks, Cheap Charlie’s is a great place to start off an evening in the City of Angels. Located off the BTS Skytrain Station Nana on Soi 11, this modest bar, and its prime location, is within walking distance of clubs, pubs, rooftops bars, and more, making it a watering hole for both tourists and expats. Scheduled to close at the end of March, be sure to visit this unique bar at least once.